This is where I write about copywriting, tear downs, customer experience and email marketing. …all in a quest to meet sales numbers, keep the General Manager happy, and make sure my Sales Director still had a job at the end of the day. And while my wardrobe no longer consists of pumps and pencil skirts and my lunches don’t come with an expense account, I do still use several of these sales tactics in my current business, all without that “stalker” feeling. See, following up with those hotel guests, businesses, and sales managers not only had a direct impact on our numbers, it was all linked to our reputation in town and, quite honestly, I liked my job a heck of a lot more when it was fun and easy. Being in business means working with people, and people require direct interaction. As Maggie Patterson once said, “We’re dealing with people, not PayPal accounts.” Have you thought about what the other side of your computer screen looks like? Unless you are directly connected to each person you interact with in your business, they aren’t thinking about you on a daily basis. Did you just launch a product that you’ve created especially for those 25 people you had on a webinar three months ago and it was nothing but crickets? Did you stare at your Facebook page (your launch plan, obviously) and wonder why it didn’t sell out instantly? Yep. I built Systems Finishing School specifically after months of answering question after question in online groups and my own feeds and even hosted a webinar and gathered questions and viewers and then I posted the sales page for SFS for those people and was like “Hey, here I made this for you!” and…… nada. A week later and I had two signups. TWO. Exciting, yes, but not the ten people I had hoped for. Not the 20-30 applications out of which I would only be able to choose 10 lucky beta testers. Not the momentum I thought I’d have. And then I remembered Marriott. Without ever once donning a pointy toe pump or a sleazy sales presence, I started following up with individual business owners who I knew were going to pick up what I was putting down. I got on the phone (yes, I got out from behind my computer screen and spoke on the phone to humans) and just listened. I shared what I know, I asked them what they needed, I followed up. One week later the beta program was full and off and running. One week later I was doing what I set out to do with Systems Finishing School – help make running a business just a bit easier. Sales without the sleaze. How to simplify the follow up process. How it can be easy. So, how’d I remember all of these people? 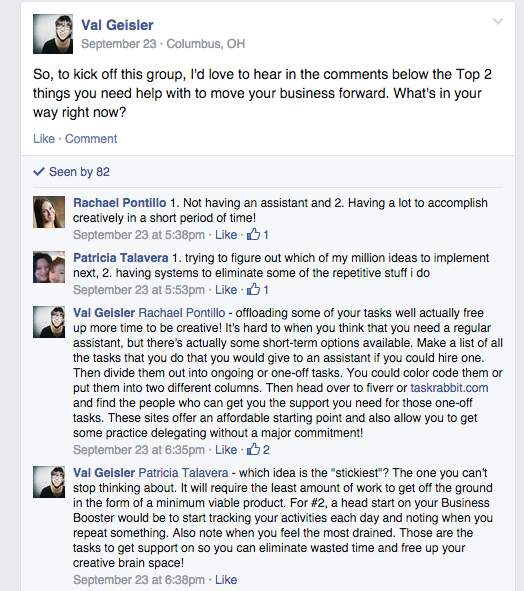 How did I recall each person from Facebook group chats to webinar attendees? Hang in there because it’s not what you think. I don’t use a CRM program. CRMs (Customer Retention Managers) are incredibly robust systems that are typically designed for large companies to track all of their clients, communication, prospects, and sales information. I am a party of one (maybe two with my VA). While I could use something like Contactually, which is better suited to the small business owner and a tool I often recommend, I like to KISS a lot when it comes to my people (um, that’s Keep It Stupid Simple, btw) and screenshot screenshot screenshot. Pro Tip: I often go an extra step and save the same screenshot to another file I have called “Product Planning” so I can reference these conversations when I’m sorting out my next offering. I do this same process when I’m emailing with someone who maybe replied to my weekly emails or just wrote me a quick note – I forward that email to Evernote and tag it to land in the Peeps to Love folder. When I’m ready to share my latest and greatest, I reference my Peeps to Love file and it tells me instantly who to connect with and how. Why Evernote and not just a folder on my computer? Because I can access it from any device and I can even use it on the go. If I grab a screenshot on my iPhone, it’s the same process there as it is if I’m at my desk. Simplified. Streamlined. In Systems Finishing School, we are talking about follow up this week. I’ve shared with them one of my standard Process Maps around following up with potential clients (and past clients). It’s not a system that will work for every business, but it works for many businesses. We talk about how the tools you use (Contactually, MailChimp, etc.) are interchangeable while the process is universal. It’s not about the minutia, it’s about the concept. Ya dig? So, if you’re looking at your business from the other side of the computer screen, are you seeing people or are you seeing PayPal accounts? Are you following up with those incredible conversations or are you letting them just sail on by? By creating processes that focus on the people, you set your business up to thrive and attract the very people you have designed your products and services to help all along. And that, my dear business owner, is what you set out to do in the first place, yes? connect, convert, and stand out in a crowded inbox. You clicked the button! Now this is a double opt in so go check your email and confirm your subscription.